The BFI have been quietly unearthing British film treasures from the 1960s and 1970s and releasing them on their Flipside DVD label. We've had bizarre docu-dramas from Arnold Miller, Richard Lester's The Bed Sitting Room, and Pete Walker and Gerry O'Hara rarities. What's utterly splendid about these releases is that they're lovingly restored in high definition and released on Blu Ray with equally interesting extras, short films on the same theme or by the same director and often some of the Bernard Braden Now And Then interviews. Each release also comes with a fascinating and well researched booklet. 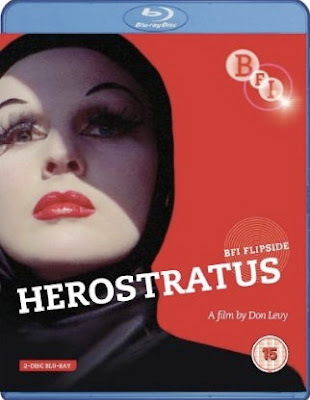 Herostratus is a key late 1960s British film from director Don Levy. It's reputation proceeds it but it's been rarely seen beyond its limited release in 1967. The film's story is simple and direct. A young poet, Max, is so disillusioned by the decline of society, its suffocating illusoriness and is tired of living on the fringes of the city that he decides to kill himself. However, he believes it should be a media event and convinces cynical advertiser Farson to take him on as a client and orchestrate the campaign so that the world will sit up and take notice of his death. The film is a satire on achieving fame at any cost and, pertinent as it was then and is even more so now, is a deeply disturbing essay about cynical media manipulation and the rotten core of capitalist propaganda. It's about a media machine that chews up a naive romantic at one end and spits him out as yet another damaged soul at the other. It's a challenge sitting through the two hours plus of Don Levy's Herostratus. And it provokes a myriad of contradictory reactions in the viewer. As a film it often lapses into tedium and you're just on the edge of your seat reaching for the remote to turn it off when something rather lovely happens and Levy pulls you back in. Experiencing, for that probably is the best word to describe it, Herostratus becomes a compelling battle of wills between you and Levy. There is some material in it that actually makes you feel a bit grubby (and no I'm not talking about Helen Mirren thrusting her ample cleavage at the camera and hilariously flogging rubber gloves to us in a lushly photographed advertisement) especially when Levy juxtaposes a stripper bumping and grinding through her routine with a butcher draining, chopping up and disemboweling a cow. Humans as the cattle of media manipulation is not the subtlest of visual allusions here. He also intersperses his 1960s psycho-drama with newsreel footage of Hitler at Nuremberg, Allen Ginsberg at the Albert Hall (which tries to connect the film's poet victim Max rather untidily to the Beat movement), concentration camp and fall-out victims. No, not a laugh a minute. Awkward and discomforting these sequences may be, and that's precisely why he put them there, Levy's real talent is in his non-linear editing technique. He's very much of the Donald Cammell and Nic Roeg school of film narrative ellipsis and Herostratus, now long forgotten, does deserve to be mentioned in the same breath as Performance and The Man Who Fell To Earth. It also compliments the similarly cynical Blow Up and owes a great deal to the despair and viciousness of Francis Bacon. Levy visually captures the aura of Bacon's work too in a series of smeared and blurred freeze frames of Max. He bends, contracts and expands time around you and around the central character of Max, mixing Max's inner demons and nightmares with the forward narrative of the film which in itself could be told in at least an hour. But that doesn't matter because despite his often zealous attitude to chopping up the visuals he does construct some stunning imagery and there are complete sequences that are utterly bravura in the way they manipulate the viewer. 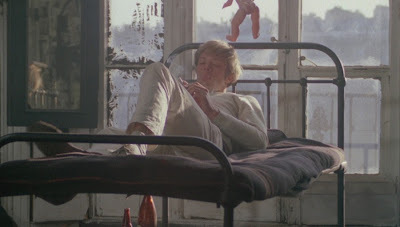 The opening of the film sees Max utterly trash his room after his landlandy demands her rent and asks him to turn down the music he has blaring out. Levy's breathless editing and whiplash camerwork fix you in the moment and the wanton destruction is conveyed as one of the most joyous and, ironically, creative, acts in the film. Indeed, creation and destruction, beauty and ugliness are oppositions that thread throughout the film. 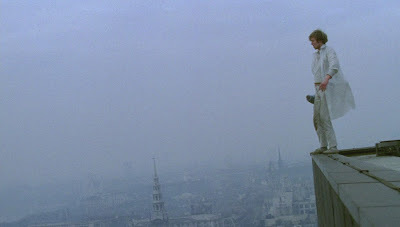 There's a scene at the end of the film where Max, realising he's been used and abused by the advertising company, goes to the rooftop, on the assigned day of his suicide, with his megaphone ready to throw himself off. The ad man waiting to photograph his demise asks him to throw himself off the side of the building he's chosen and in a bid to get him to follow the instructions of the media campaign he runs to grab Max and to get him to move. There's a heart stopping tussle right on the edge of the building that will make your stomach leap. The camera whirls about and it's so vividly 'real' that it's a palpable shock when the ad man falls to his death. Central to the film's compelling, hypnotic force is a wonderful performance from Michael Gothard as Max. Gothard was someone I'd always admired since seeing his scene stealing turn as an indestructible vampire in AIP's atypical horror Scream And Scream Again. A highly charismatic presence, he was superb in Russell's The Devils, made a terrific villain in the Bond film, For Your Eyes Only and was Oliver Tobias' sidekick in the HTV series Arthur Of The Britons. His role as Max in Herostratus puts him centre stage and shows us what a phenomenally good actor he was. Unfortunately, he never really had the opportunity to show his complexities as performer elsewhere. Sadly, both he and Levy took their own lives which seems to bring the whole experience of watching Herostratus to a grim full circle. An actor and director making a film about a failed grasp for fame in a capitalist society that suggests you're actually better off remaining in obscurity uncannily sums up their truncated careers. It's an experimental film, deliberately subjecting its audience to a lot of visual and audio manipulations rather than concentrating on plot or character. It will annoy you and at times frustrate you. The scene with Max and Farson's secretary Clio on the bed is interminably long but it's an essential scene that provides the central character with some hope even though Farson humiliates Max by revealing that Clio was paid to seduce him. It just takes a long time to get to the pay off. Levy's film is an acquired taste but his progressive use of montage and the film's definite sense of time and place, where one man's decline happens within a late 1960s landscape of desolation, make it an intriguing and beguiling art work. BFI have once again provided a very good transfer. Somewhat uneven in contrast at times and often the picture is soft but it's very clean with very little in the way of blemishes. I like the slightly faded colour palette. The sound stage is used by Levy to fill the film was very strange noises that add to the viewing experience. The dialogue is sometimes muffled and low and occasionally can be a strain to hear. • Alternative 1.33:1 full frame presentation (Blu-ray exclusive extra). Thanks to MovieMail and Criterion for the images.